On my daughter’s third birthday a few years ago, we hosted a backyard barbecue to bring together our friends and family. As the rest of us rushed around getting everything ready, she sat on the front step of our house, watching and waiting for her guests to arrive. I had spent the week before in preparation - I was busy! But as I passed the front door on my way up the stairs that day, I stopped and looked at this little person, her knees tucked up, watching the driveway with great anticipation. When the first guest arrived, she ran across the front yard to greet them and walk them to the house. She did that again and again, for each guest, with a smile of joy and love on her face. In today’s readings, we are invited to consider hospitality in our relationships with others and with God. What does it take to receive others into our life? What does it take to receive God? What do we have to put aside? What are the fruits of hospitality? How is God reaching out to receive us? In the first reading the Shunammite woman welcomes Elisha, the holy man of God who has come to dine with her and her husband. Once they welcome him to their table, she takes her hospitality a step further. She takes the initiative to create a space for him to stay. It is a unique moment in Scripture as she -- a married woman -- puts forth this idea to her husband; but she is determined to receive him in her home and offer him a place to rest, to just be. Elisha, moved by her generosity toward him, asks God to reward her hospitality with a son, even though she and her husband were advanced in years. She opened her heart and home to the person in front of her, and she was rewarded for it with joy, love, and new life. How often do we take the initiative, go the extra mile, reach out beyond our regular duties to offer hospitality? One of the most important parts of Saint Benedict’s Rule of Life encourages monks and nuns to “. . .let all guests who arrive be received like Christ.” It takes them out of their daily routine to encounter God in the other. In my ministry with college students, I see how getting caught up in the details can overrun the opportunity to receive others wholeheartedly, to love and be loved in the moment. It is easy to put other things first. It’s satisfying to check off a list instead of looking at the person in front of you. So often we can get caught up in the demands of our daily lives. Life is fast-paced. I have emails to send, appointments and meetings and deadlines to make, bills to pay, responsibilities to attend to. It takes vulnerability to stop, to let God love me and receive me, to draw me into God’s life so that I can then extend that love toward others. Yet that is what I long for, what we all long for -- as Saint Augustine said, our hearts are restless until they rest in the Lord. We long to be welcomed as we are, to belong. Jesus is hospitality personified. How many times in the Gospels do we read of Jesus inviting others to eat with him, of drawing people in from the margins to break bread and grow in relationship with him, to be loved? Jesus invites and receives us into life with him, and invites us to extend that hospitality and love to others. So when my little three year -old -daughter sat on that front step, I saw true hospitality. As I was busy with my to-do list and chores, my daughter sat with her open heart and hands, ready to receive. It is a model for me, both of what it means to receive people in hospitality, but also what I imagine God feels when receiving us with open hands and open heart: Pure love and joy. And that can make us sing as the psalmist sings today, of the goodness of the Lord! Crista Mahoney earned her Master of Divinity from Boston College School of Theology and Ministry. She graduated with a BA in English from the College of the Holy Cross in 2002. Crista then served a year with the Jesuit Volunteer Corps in Ashland, MT, and taught English at the Nativity School of Worcester and North Cambridge Catholic Cristo Rey High School before returning to graduate school. 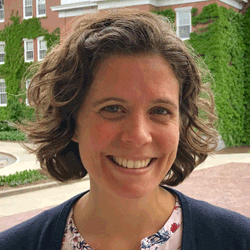 Her professional ministry began in campus ministry at Emmanuel College in Boston, MA, and she currently works as the Catholic Chaplain on a multi-faith team at Babson College in Wellesley, MA. Crista helped co-found the Jesuit Connection young adult group with the New England Province of Jesuits, and is currently on the Board for Sacred Threads in Newton, MA, a non-profit that offers women opportunities for spiritual nourishment, connection, and inspiration. She also accompanies people of all ages in their spiritual journeys on retreat. She and her family live in Sherborn, MA where she enjoys leading her daughter’s Daisy Troop and playing trucks and trains with her son.